This is the summary of consumer reviews for Honeywell RTH7600D Touchscreen 7-Day Programmable Thermostat. The BoolPool rating for this product is Very Good, with 4.30 stars, and the price range is $49.99-$99.99. 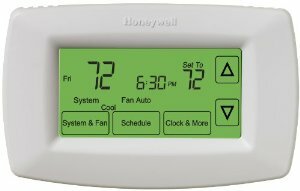 The Honeywell RTH7600D Touchscreen is a 7-Day Programmable Thermostat and can be both battery or wired operated. It is easy to install and use, packed with features and option, yet so simple to program. This compact unit features a large easy to see/use green backlit touch screen with easy to follow text instead of symbols. The RTH7600D is compatible with heating and cooling systems plus heat pumps, though it does not work with electric baseboard heat. The smart response technology continuously adjusts to the pre-heating and cooling of the house, starts couple of hours earlier to reach at there-programmed time for maximum comfort. The unit also have permanent day and time backup, all program information is saved in the event of power outage. It is designed to program each day of the week differently, with four program periods per day. Some other features include - automatic changes from heat to cool; precisely control the temperature of +/- 1-degree Fahrenheit; optional automatic daylight saving time adjustment and a filter change reminder. 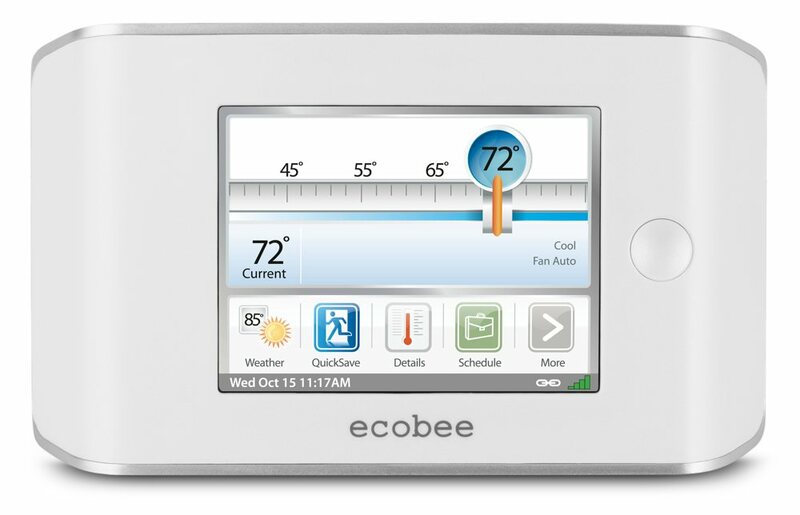 This thermostat provides the ability to save up to 33% on annual heating and cooling costs, depending on correct programs as per energy usage and geography. The unit comes with an easy to understand installation guide. However, in some cases, units stopped turning on the AC and could not control the furnaces. Some units did not follow the program inputs. The clicking on/off noise from the units is loud as per some users and some touch screens were unresponsive. Some users feel the advanced setting is little confusing and it is tedious to change the programs on daily basis. It is advisable to check the existing wiring system of the house by visiting the Honeywell's site and cut the power supply of the heating system before installation. 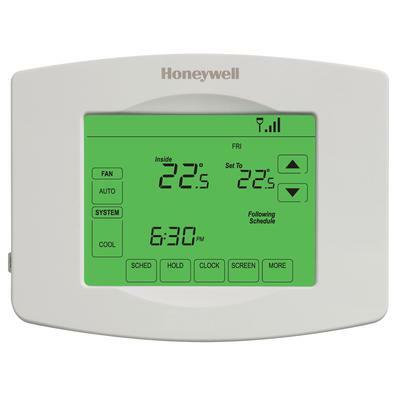 Overall, the Honeywell RTH7600D Touchscreen 7-Day Programmable Thermostat is recommended home thermostat, designed for easy use and installation, packed with great features and easily programmable by even a layman; more importantly an affordable cost saving device. Bear in mind that how you program them will effect your savings. The 7 day programming has been a nice feature. It displays correctly as to what's been programmed but won't follow it. I purchased the Honeywell RTH7600D for the cost savings. It's super friendly to program and conveniently can be removed from the wall to do so. This device doesn't follow the programming that's been input. Has total furnace time for day, yesterday and total since reset. We've the typical single-stage heating and cooling system; gas furnace and conventional A/C. However the installation manual has additional instructions for Multistage Heat and Cool, Heat Pump without Backup Heat, Heat Pump with Backup Heat, Heat Only or Cool Only systems. This model supports a heat pump and separate furnace with EM heat setting. 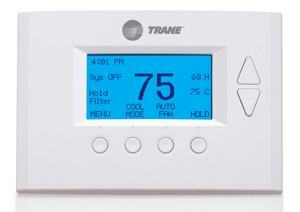 Once again this thermostat works with heat pumps with back up electric heat. I installed this on a heat pump with auxiliary heat and, initially, the AUX heat ran too often, as detailed below. No where in the description does it say it won't work with a heat pump that's 2 stages heat (aux heat). For a heat pump with auxiliary heat - When the room temperature is 2 F cooler than the set point, the auxiliary heat comes on. I've a heat pump system whose thermostat was original (early 80s). I've found most cheaper brands will work with my heat pump. Since this thermostat works with heat pumps with auxiliary heat, I expected to be able to set the heat to 60 F during the day, and have the temperature return to 70 F upon returning home without the use of auxiliary heat. Install took me probably 15 minutes each unit. So one unit works fine and the other needs replacement. Our first unit came DOA and Amazon quickly replaced it for us. Bought two of these to replace a couple of old mercury-based units but once installed these thermostats wouldn't control the furnace. Reading the manuals first, and reading the reviews here, made the installation fairly easy. This unit is a nice 7 day programmable unit that's a touch screen which is the only difference from the 7500. Also, I read a review that mentioned a loud "clicking" noise the unit makes when kicking on and off. I bought this thermostat to replace a Chinese manufactured home depot touch screen special that was about 5 years old and failing. The unit seemed to be working fine after changing the batteries, so I thought all was well and I just had a power-hungry thermostat. Overall very nice, easy install, easy to read, nice backlight, looks nice, programming intuitive but a bit tedious. touch screen easy to push. - Easy to install (once you've the correct wiring instructions). This seems like it should be a given, though I've dealt with touch screen units in other homes that require a touch it to light it, however that first touch changes settings at the same time). The screen is clear and easy to read. Installation went smoothly, but after all the wiring had been done parts of the touch screen were unresponsive. I suggest looking at the installation guide on Honeywell's site before buying and checking-out your existing wiring to make sure it make sense. - Cut the power supply to your heating system before installation!. If you've a heat pump you've to know whether the control valve switches in heat mode or cooling mode ('O' wire is cooling mode switch and 'B' wire is heating mode switch). 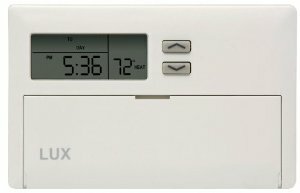 This thermostat does provide 7 day control, fully automatic heat/cool switching (as long as you go into the confusing numeric code based advanced setup), and excellent and solid home temperature without wild temperature swings. I was also happy to find that it's a self-learning feature, so after some time it'll know how long ahead it must start heating or cooling to reach the target temperature at the correct time. It's also important to know what type of system you've (heat pump, "straight cool", gas furnace, 1 stage, 2 stage...etc.) so you can program the t-stat to work with your system. Once installed and working, the thermostat has a feature that ensures it reaches the right temperatures *at* the times I specified. Can independently control the heat and cool temperatures. If left in default mode, the thermostat will start an hour or two early before the time programmed for a specified temperature to be reached. Programming the temperature and times is really slick - you can select any day or days of the week and make them the same program. If we leave it on smart response -- where the system "learns" how long it takes the house to recover to full temperature and starts the system ahead of time accordingly, we'll have the full heating cycle beginning hours before we want the temperature at the normal set temp. Advanced programming relies on codes. Programming is easy, just follow the instructions.